Arum: Unlike Mikey Garcia, Amir Khan Intends To Win His Fight! 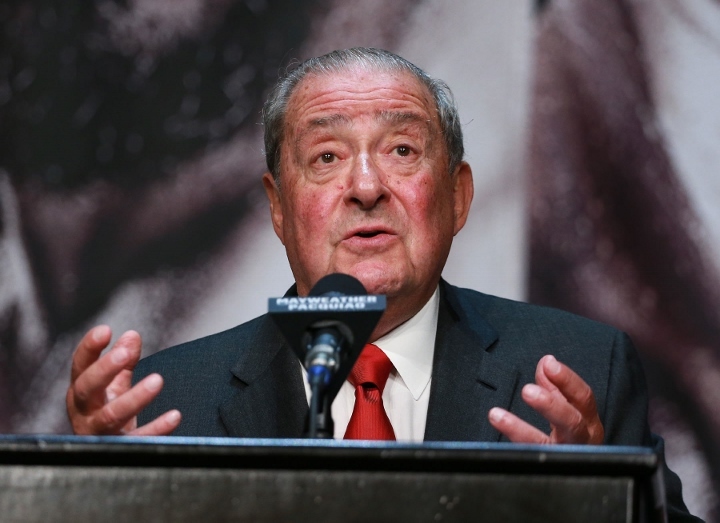 On Monday, Top Rank's CEO Bob Arum took aim at four division world champion Mikey Garcia. This past Saturday night, Garcia suffered a one-sided twelve round decision loss to IBF welterweight champion Errol Spence at AT&T Stadium in Arlington, Texas. Garcia, who holds the WBC lightweight title, was moving up by two weight classes to take the fight. The Spence vs. Garcia showdown headlined a Fox Sports Pay-Per-View event. Next month, on April 20, Arum's company will stage their own pay-per-view, on rival network ESPN, with Terence Crawford defending his WBO welterweight title against British star Amir Khan, who like Garcia is a massive underdog. Arum took a big swipe at Garcia's performance and his character, and laid some high praise on Khan. "Unlike Mikey Garcia, Amir Khan goes into a fight intending to win. His boxing ability, which is phenomenal, could give Terence Crawford fits. He is capable of pulling the upset," Arum stated. Additionally, Top Rank's top matchmaker Bruce Trampler also took aim at the Spence vs. Garcia bout. "Amazing how media supports Spence beating [a] blown up lightweight and calling out aging Pac-Man but if Top Tank made Terence Crawford vs Mikey or Manny, we’d be condemned. Crawford’s next challenger Amir Khan would beat Pac or Mikey so media experts, demand Spence vs Crawford," Trampler stated. "No question, Spence is a hell of a fighter. A big southpaw who can box and punch. All respect to Errol, I’m just saying Terence Crawford would beat him." Top Rank had at one time promoted Garcia, who broke away from their banner after a two-year legal battle. Since his departure, Garcia has become a much bigger star and recognized as a pound-for-pound fighter. There are some arguments to be made against Top Rank's position. Crawford's biggest win is arguably against Yuriokis Gamboa, who like Garcia was fighting two weight divisions higher than he should have been. Khan's ability to beat Garcia or Pacquiao is up for debate. In his last fight with Samuel Vargas in the fall of 2018, the Bolton boxer was dropped and admittedly hurt in the late stages of the contest (Vargas was stopped by Spence in four rounds and stopped by Danny Garcia in seven). Vargas also lost a decision to 37-year-old Luis Collazo this past Sunday in New York City. And Top Rank had attempted to make Crawford-Pacquiao on several occasions without success.